With our fl exible all-rounder you can rely on water, gas, heating and district heating always on the right angle piece. Our elbow handpieces are suitable for drinking water hygiene Material manufactured and are therefore optmal for use in the drinking water sector. Our elbow handpieces are made of thermally relaxed brass. All drinking water-contacting components consist of high quality UBA compliant material. The material is hygienically hygienic suitable and complies with the legal requirements (Drinking Water Ordinance, UBA list). 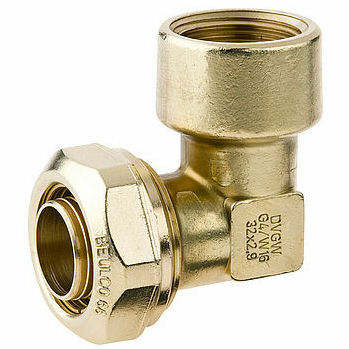 The reliable one brass material ensures a special longevity. The model is available in different versions. Thread sizes: 1/2 "- 2 1/2"